James Morrison : Surfriding in Tahiti, 1788-1791. Pages 20 and 21, 113, 114, 115, 335 to 337. Journal of James Morrison on the ‘Bounty´ and at Tahiti, bequeathed to the Public Library of N.S.W. by will of the late Rev. A.G.K. L´Estrange, through the medium of Messrs Church, Adams, Prior and Palmer, Solicitors, 11 Balford Rd, London, W.C.
Lt William Bligh, captain of HMAV Bounty, stayed five months Tahiti, (1788-1789) on a failed mission to transport breadfruit from Tahiti to the West Indies, culminating in the infamous mutiny in1789. James Morrison, boatswain's mate on HMS Bounty at the time of the mutiny. Following the mutiny on the Bounty, Bligh was again dispatched to Tahiti in 1791, this time successfully completing the mission. Surfriding in Tahiti, using a damaged canoe, was reported in 1769 by Joseph Banks on Cook's first Pacific voyage in the Endeavour. See 1769 Joseph Banks : Surf-riding in Tahiti. On Cook's third pacific voyage, William Anderson, Surgeon 'Resolution' reported canoe surfriding in Tahiti, August-September 1777. On one of Bligh's visits (1777 to 1791) he is reported to have observed Tahitian surfriders using rudimentary craft - their canoe paddles. There is not the spape in this volume to include the entire log for this period, so I have selected those parts which bear upon the ship's mission and upon the mutiny to come; and I have included other items which appear to be of particular general and nautical interest. 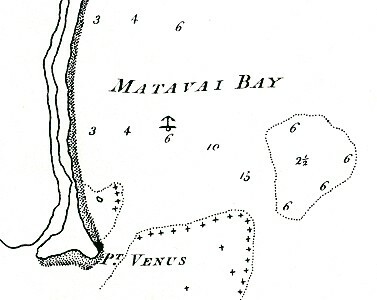 Tahiti, 20th and 21st December 1778. On the 20th we had heavy rains & a strong Gale of Wind from the N W which brought with it a heavy sea from that Quarter breaking so violently on the Dolphin Bank that the Surge run fairly over the Ship, and the Carpenter who ..
was the evening before Confined to his Cabbin, was now released to secure the Hatches. Next day the Gale abated, but the surf run very high on the shore so as to prevent landing either in Canoes or Boats. However several of the Natives found the way off through it, and brought bunches of Cocoa Nuts with them that were full as much as one of us could haul up the side tho they had swam off with them through a tremendous surf. On the 4th the Weather being fair, I set out to the Hills accompanied by some of Poenos Men, & one who lived with myself Constantly, in quest of timbers, and returned with several, the Poorow being plenty in the Mountains; but Mostly at a Good distance as they always take the first at hand for their own Use— these We sided as usual and laid them to dry, the Natives Frequently assembled about us to see our work, and seemd much surprized at our method of building, and always assisted willingly to haul the Trees to hand, & hew off the rough; they are very dexterous at Spliting, but as they have no Idea of working by rule, they could be of no use in triming the Plank. Nor was the making of Plank less troublesome, having no Saws (except handsaws) the largest tree would afford no more then two thicknesses of Plank, Some of the trees Cut for that purpose measuring six feet round which took a deal of Labour to reduce into plank of Inch & a quarter with axes & adzes; and as we had but two Adzes we were forced to make the Small trade hatchets (such as are sold in London at gd. each) answer that purpose, by lashing them to handles after the manner of the Natives which answered our purpose very well. And here I may also observe that a deal of Labour might have been saved by workmen, who understood their business, by trimming the Timber in the Mountains, which would have made a Considerable Odds in the Weight, but of this I was not a sufficient Judge, and was therefore obliged to bring it home in the rough, and Trim it afterwards, however this appeard but trifling in point of difficulty and was not Sufficient to make us abandon our project. ... great Activity and diving under the surge swim out again towing their plank with them — at this diversion both Sexes are Excellent, and some are so expert as to stand on their board till the Surf breaks — the Children also take their sport in the smaller surfs and as Most learn to swim as soon as walk few or no accidents happen from Drowning. They resort to this sport in great Numbers and keep at it for several Hours and as they often encounter each other in their passage out and in they require the greatest Skill in swimming to keep from running foul of each other — which they somtimes cannot avoid in which case both are Violently dashd on shore where they are thrown neck & heels and often find very Coarse landing, which however they take little Notice of and recovering themselves regain their boards & return to their sport. The Chiefs are in general best at this as well as all other Diversions, nor are their Weomen behind hand at it. Eddea is one of the Best among the Society Islands & able to hold it with the Best of the Men Swimmers. This Diversion took place during the time the Bounty lay in Maatavye Bay when the Surf from the Dolphin Bank ran so high as to break over her, and we were forced to secure the Hatches expecting the Ship to go on shore evry Minute. ... been out in their Canoes or have been wet with salt water. They have also a diversion in Canoes, which they steer on the top of the Surf with Great dexterity, and can either turn them out before it breakes or land safe tho it Break ever so high. The Dolphin Bank is to the east of the anchorage. As a result of two extreme surf events that threatened the safety of the ship, Bligh moved the Bounty north to Toaroah Harbour for the remainer of the visit, departing on Sunday 5th April 1789. Between pages 104 and 105. Solicitors, 11 Balford Rd, London, W.C.
(London: The Golden Cockerel Press, 1935) pp. 226. 1 st descriptions of surfing in Tahiti "at this diversion all sexes are excellent... the children also take their sport in the smaller surfs". Geoff Cater (1997-2007) : James Morrison : Surf-riding in Tahiti, 1788.